To watch this Video-Recipe, click HERE!! Hi Everyone! Today's recipe is a delicious treat to enjoy the rest of the hot summer days, really easy to make, super refreshing and beyond delicious! I hope you like it as much as I do. In a small saucepan on medium heat, add in 1 cup of orange juice, the zest of 1 orange, ½ cup sugar, cayenne pepper to taste, and 2 tablespoons of lemon juice, stir together and cook on medium heat for about 5 minutes or until the sugar is well dissolved. Set aside until ready to use. 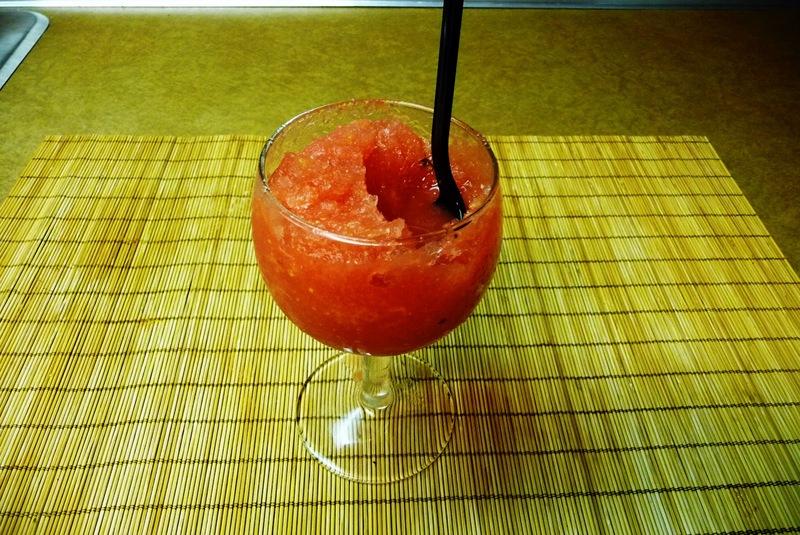 In a blender or food processor, blend the watermelon on high for about 2 minutes or until the watermelon is blended into a very thin watermelon juice. Do not add any water, if the watermelon is too hard to blend, add some of the Orange juice mixture instead of adding water!! In a large container, combine the watermelon juice with the orange juice mixture, stir together, taste the flavor and add any more sugar if needed, you can also add 1 extra tablespoon of lemon juice if you want to. Stir again, cover the container with a lid, and place in the freezer for 2 hours. After 2 hours, it should be somewhat firm, but not completely solid, scrape the ice mixture with a fork, just to prevent it from forming into a thick block of ice, and place back in the freezer for 2 more hours. 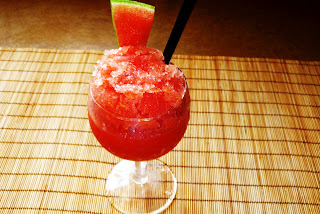 After that, it should be done, scrape down the icy watermelon block with a fork or a spoon, just to break it down a little bit, a Granita should have the texture of small ice crystals, so keep on scraping down until you get the desire texture. And that's it, serve and enjoy! You can drizzle some orange flavored vodka over the Granita to kick it up a notch!